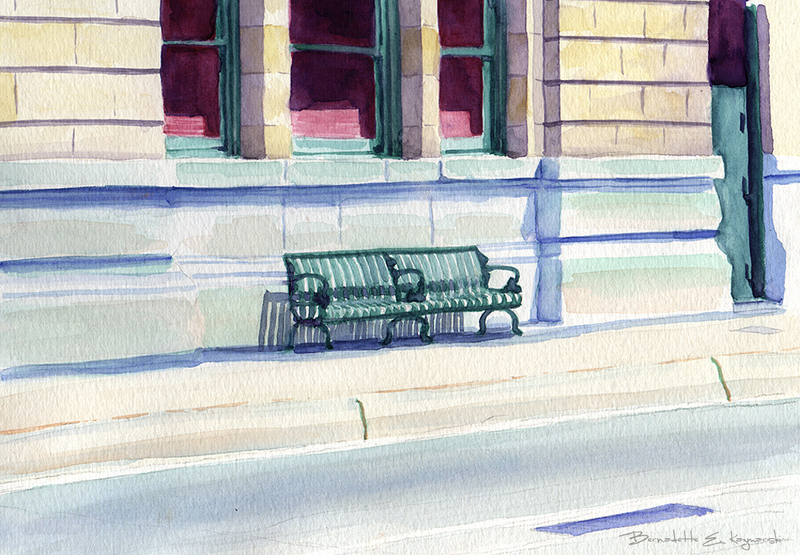 Waiting Bench, Prints are made in archival inks on Epson Velvet Art Paper, Cold Press Digital Giclee Paper or Artist Canvas. Pennsylvania Station had been cleaned up and updated with new paints and benches and on a sunny day the bright colors and clear shadows were stunning. I created this work for an exhibit I had in 2006 entitled “100 West Busway”, featuring 125 thumbnail photos of Pittsburgh taken through the bus window on the round-trip journey from Carnegie and back on the 100 West Busway route, running from the south hills into downtown Pittsburgh, through the east end and Oakland and all the colleges and research centers, back into downtown and back to the suburbs. From the 125 thumbnails I created a dozen works, each in a different medium, all framed with black wood frames and white mats. This is one of those pieces, and is actually one of the originals from the show. I offer giclees of this painting in two different sizes: the full size of 31″ x 23″, a half-size of 16″ x 12.5″. The giclees have 2″ of white around the outside edges. All are countersigned by me. I usually have at least one of the smaller sizes of canvases on hand, but order larger ones as they are ordered because I have limited storage space. Smaller canvases are a 3/4″ in depth, Canvases 12 x 16 and larger are 1-1/2″ in depth. I set them up so the image runs from edge to edge, then the sides are black or white or sometimes I slip in a color that coordinates with the painting. This canvas mirrors the edges of the image around the sides. This entry was posted on March 30, 2016 by Bernadette.